TUSCALOOSA, Ala. (AP) — Alabama’s defense sucked all the drama out of the ending with stop after stop, even as injuries took their toll. 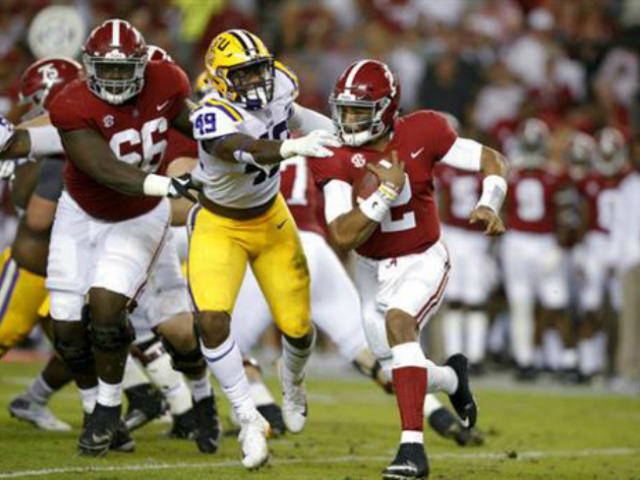 The Tide (9-0, 6-0 Southeastern Conference) had to withstand a rare challenge this season from a league opponent, but the nation’s top defense didn’t allow much hope in the fourth quarter. The game took a toll on Alabama’s defense. Linebackers Shaun Dion Hamilton (knee) and Mack Wilson (foot) are “probably out,” Saban said, indicating they’re potentially long-term injuries. Alabama: The league’s top rushing offense was bottled up most of the night, despite a few nice runs by Hurts. Gained 116 yards on 36 carries. Shut down a star LSU tailback again after throttling Leonard Fournette the past two years. Hurts passed for 183 yards, including a 4-yard TD to Irv Smith, and ran for 44.